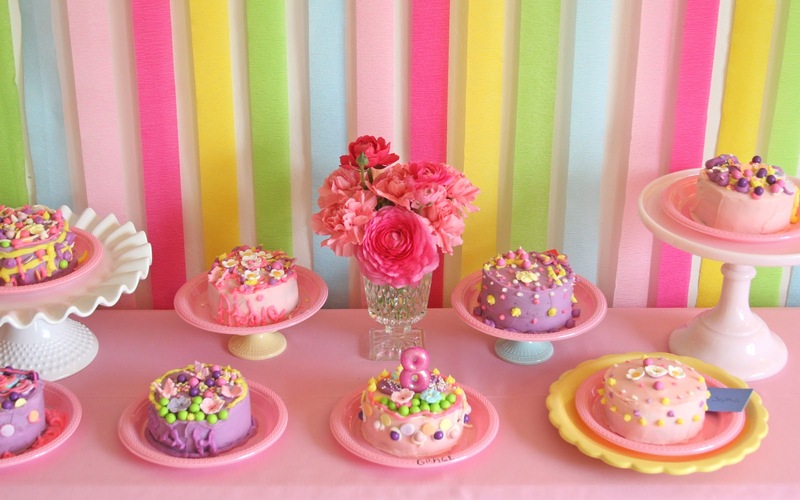 I have an extra fun post to share today, my daughter Grace’s 8th birthday party! 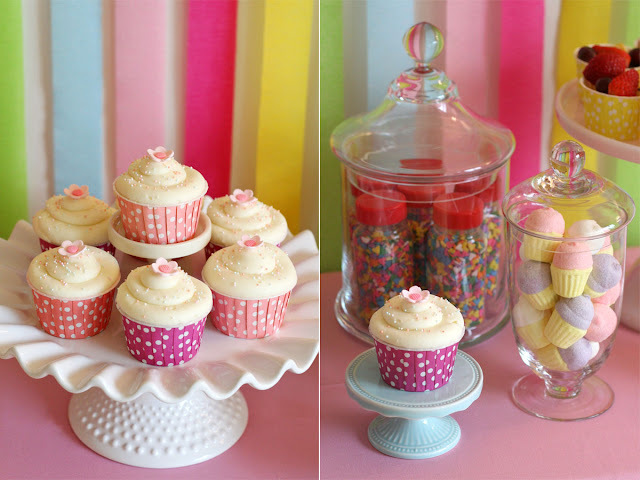 Two years ago, I put together a fun Candy Birthday Party for her… it was one of my first blog posts, and will always be a special party to me. We do “big” parties for our girls every other year (celebrating the “off” year with just one or two friends). 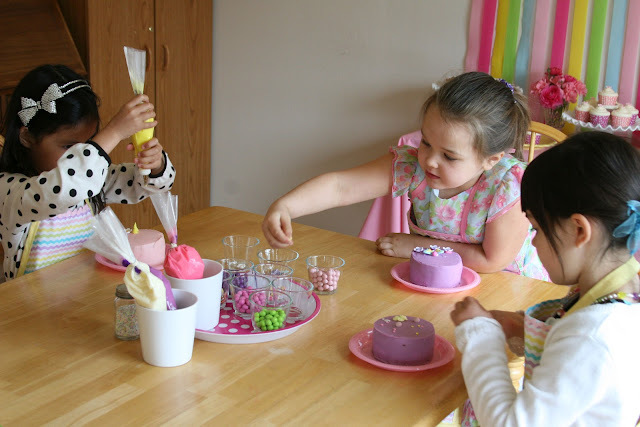 Grace is a girl after my own heart, and chose a “Cake Decorating Party” as this year’s theme. 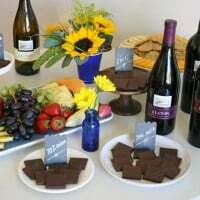 I prepared a small dessert and snack table for the girls to enjoy. Chocolate cupcakes in cute polka-dot treat cups (from Shop Sweet Lulu) were frosted with vanilla cream cheese frosting (using a large round tip) and dressed with simple sugarpaste flowers (from Sweet Baking Supply). I also filled yellow treat cups with fresh fruit, and blue treat cups (both from Shop Sweet Lulu) with chex mix. A pretty little jar was filled with cute cupcake shaped marshmallows I found at Wal-Mart in the Easter candy section. A large jar was filled with containers of rainbow heart sprinkles (from Sweet Baking Supply) which each guest took home as a favor. I baked and (plainly) frosted mini cakes for each guest to decorate as they please. I baked the cakes in small (4″) pans (from Sweet Baking Supply) and frosted them in either pink or purple vanilla buttercream. I prepared several piping bags of icing, with assorted tips, for the girls to use to decorate their cakes. I also supplied them with an assortment of candies, sprinkles and decorations to add to their masterpieces. The girls decorated their cakes in shifts… while some were decorating cakes, the other girls were in the kitchen making mini pizzas with my husband. The pizza’s, along with the fresh fruit cups, chex mix and juice completed the simple, yet well received menu. 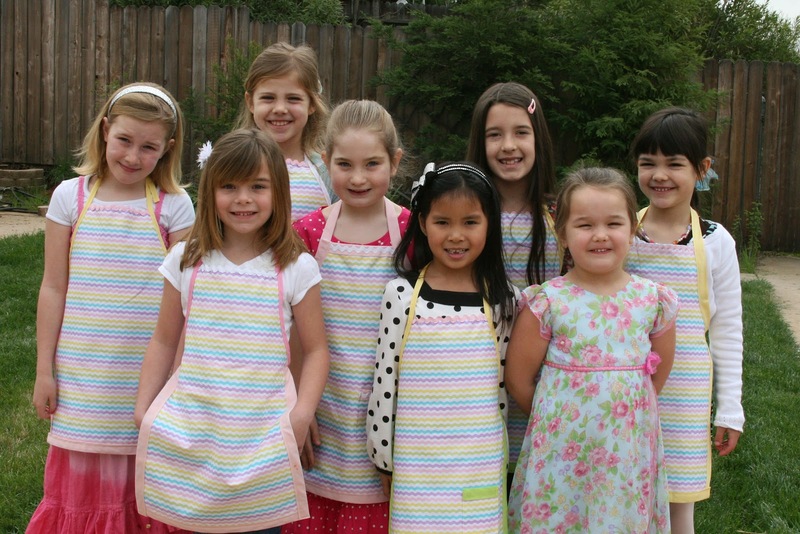 Along with a bottle of sprinkles (shown on the dessert/snack table), and the mini cakes themselves, each girl took home an apron that I made as a special favor. I made each one a bit different, using different color trimmings. 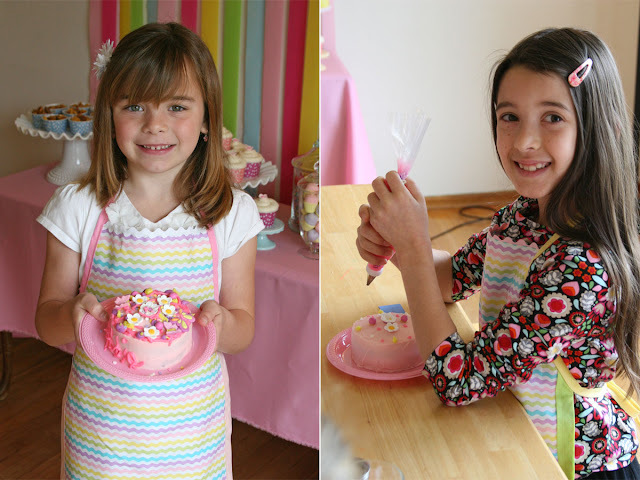 I’ve posted the full tutorial for these Easy Sew Kid Aprons (here). Additionally, I’ve include links within this post that will direct you to the recipes, techniques or supplies I’ve used. What a fun and adorable party! This is one of the cutest ideas ever! And all the girsl made really adorable cakes! You're such a fun mom! … Wanna throw my birthday party next year? So adorable! I have wanted to do something similar…need to get my act together for next year!! How fabulous! 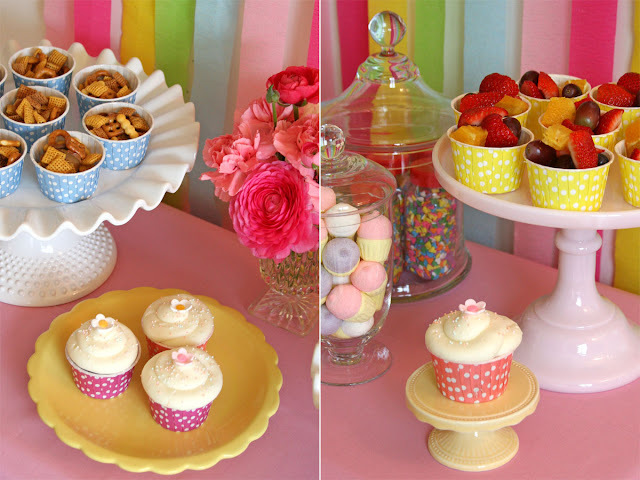 Where did you get all of your beautiful cake/ cupcake stands? Brilliant!! I love it, and my daughter would too. 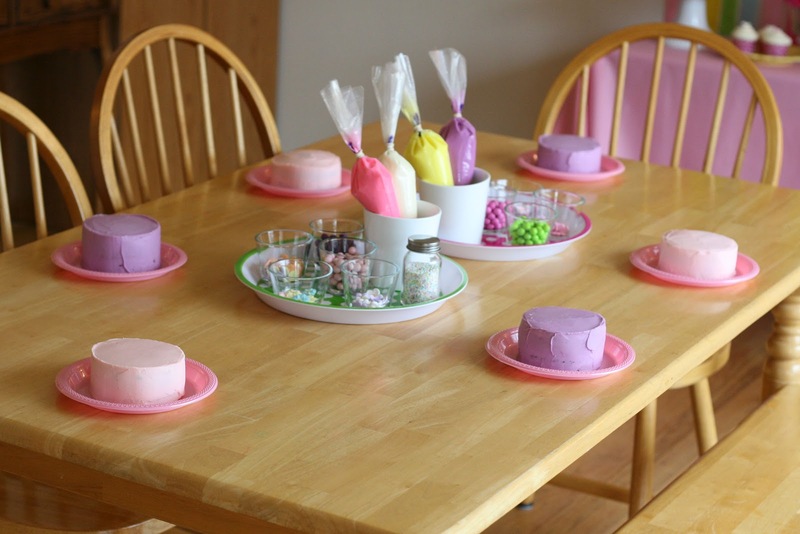 My Daisy scout troop has been asking about a cake-decorating event – this would be perfect. Such a good idea ! I can't tell you how excited I was to see your pics of this party. 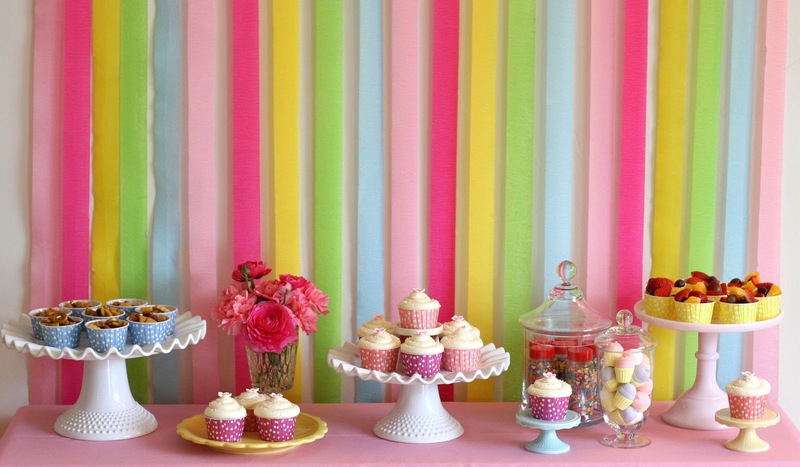 In particular, the shot of the girls decorating their cakes and the dessert table is in view on the side. Why does that interest me? Because I always wondered where in the world in a regular home does someone have room for a rectangle table and a giant blank wall just ready for a dessert table set up!?! I have no such wall in my house. Well, there is one wall that might work but it's in the foyer! How would that work for party flow, right? Anyway, I love the dessert tabe set ups but I wish party designers would show where in the home they put the elaborate dessert table. I've been following your blog for several months and it's become a favorite, I think because everything you do is so ME as well! I've never left a comment before, but when I saw your table with four chairs and a bench that is exactly like the one in my kitchen, I just couldn't resist! I especially enjoy your beautiful photography, sweet and simple (well "simpler" anyway!) parties and great decorating/packaging ideas. Also, I use your recipe for chocolate cupcakes all the time. Thank you so much!! LOVE this! What mini geniuses. You are such a great Mom! Your attention to detail is astounding. Yay for you and your girls! 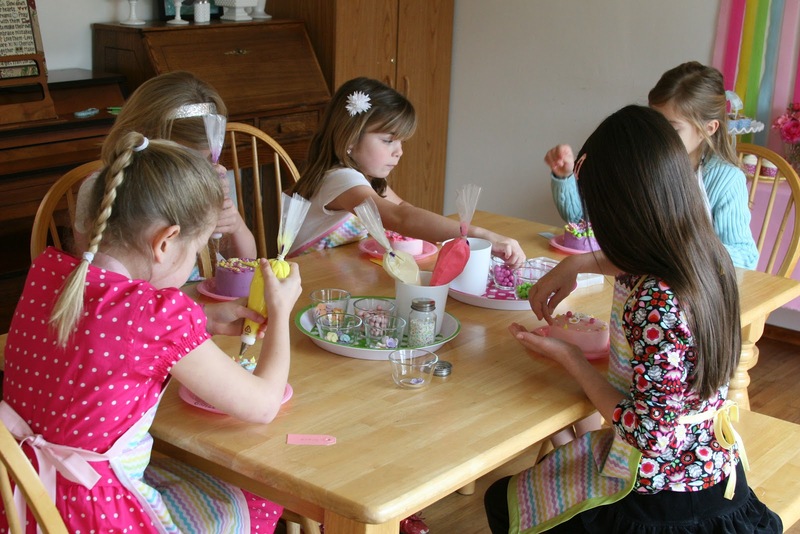 This is one of the sweetest, most wholesome, most adorable-ist parties I have even seen for little girls. Bravo, you fabulous mom. Hi Glory, You did it again. Another Amazing Birthday party. Thank you for sharing it with us. Looking forward to the apron tutorial. By the way, where did you get the yellow and the blue cupcake stand?? I'm late in reading my favorite blogs, but this was just incredible! You are the best mom ever! What a beautiful party and I LOVE the homemade aprons. As soon as I saw the first picture with the apron, I thought to myself, ooh I wonder where she got that cute apron and then saw more of them and read that you made them for each of Grace's friends! Incredible! 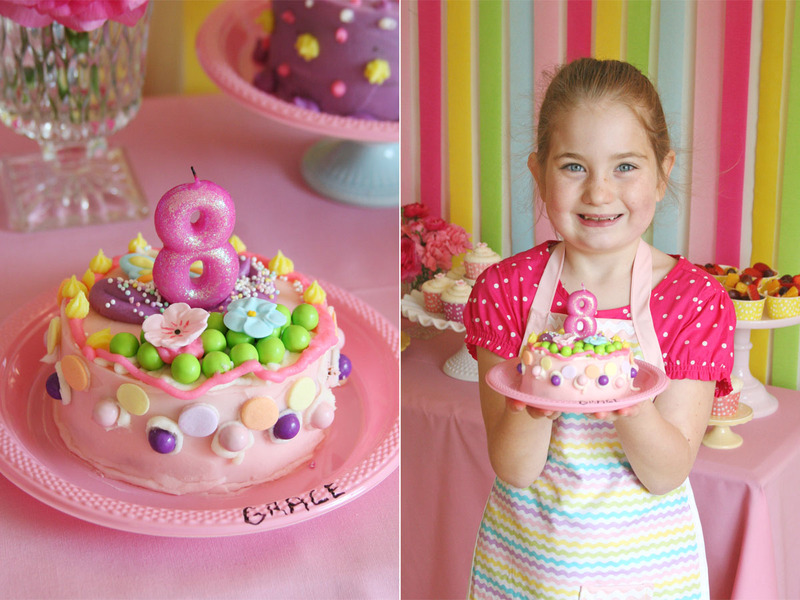 I bet Grace loved her party and had so much fun making cakes with her friends. Everything looked beautiful and fun! Excellent job Glory and thanks for sharing! This is one of the most adorable little girl parties I've seen! So beautifully planned to be hands-on and FUN. I would've loved to be a guest myself! Love this idea. My daughter is turning 8 this year and I think this would be a fun activity we could do for her party. Thanks for sharing. Everyone is raving because this was the best party idea!!! I love the aprons and cake decorating and thoughtful mom and dad! Just the best! Wow !! very nice blog and very intersting. thank you for sharing us. It may seem simple, but where did you get the adorable 8 candle? My daughter turns 2 in a couple weeks and I've been looking for something different (not the typical polka dot number candles that you find in grocery stores). I saw this glittery pink 8 and fell in love!! wow this is totally what i want to do for both my daughters. thanks for the idea!!! hello ,i was looking at the party that you did for your beautyfull daughter and i just love the idea ,i am just wondering how much do you charge for a party lke this .the reason i am asking is because i have a friend that wants me to do a kid party but i not a professional ,i made my friend a cake and her friend loved it so much that they want me to do a kid party but like i said i am just starting and dont knowexactly how much to charge for all .can you please help me if you can thank you i look fowared from hearing from you. I don’t do my parties for money… just for family and close friends. Figure out all of your supplies, and how long it will take you to plan and set up the party, then decide how much you want to be paid per hour of your work. I love your idea and creations. You are very creative mom! The kids must have fun with the cake they decorate by themselves. Amazing job! I love this concept! Definitely a nice spin from the traditional birthday party favors! 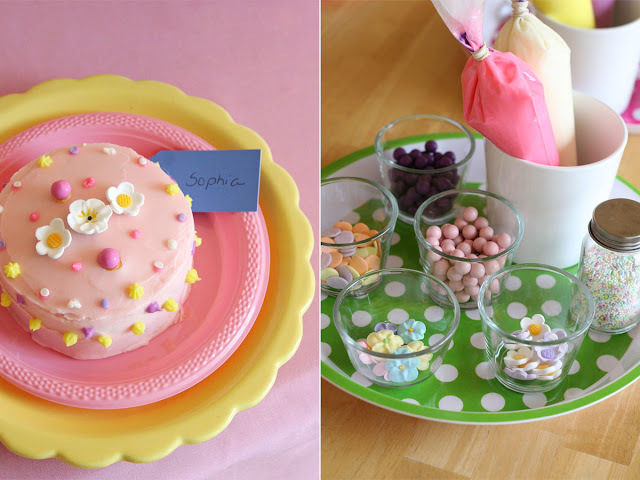 I found your post last summer about the candy party and used a lot of our ideas for my daughter’s 6th birthday – it was so much fun! Now I find your post on the cake decorating party and know that this will be the idea for her 7th birthday! You do such an awesome job! Son fabulosos…. Cada detalle es increíble…. 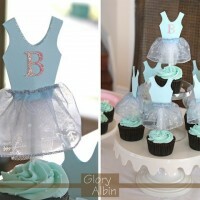 What a great party theme for little girls. With all the cooking shows these days, going to a party to create their very own cake would be something to look forward to. Excellent party favor choices. Love the set-up. Wondering where you buy your fancy plates and cake stand? I love it all especially the yellow plate. Thanks Cristina, I’m sorry I don’t remember where the yellow plate is from, I’ve had it quite a while. I buy a lot of my plates and props from Home Goods, World Market, Pier One and Target. Hi! I’m planning a cake decorating party for my daughter next week and was wondering where you purchased those mini flower decorations for the cake? Thank you so much in advance, this is one of the cutest parties ever! Hi Sarah, Most of the pre-made icing flowers were purchased at Hobby Lobby (in the cake decorating area). Happy shopping! Thank you for answering my question so promptly! I followed your idea and organized a cake decorating party for my daughter’s 10th birthday. It was wonderful. I made my buttercream frosting too stiff and it was a little difficult for the girls to squeeze the frosting out of the bags. So I would recommend making the frosting soft. Also it is quite time consuming to bake all those little cakes as I only had 2 6-inche cake pans. 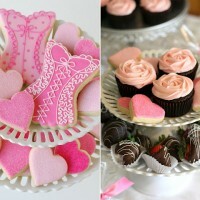 Great idea and best cake stand i like your blog >Thanks for sharing nice information. I also go all out for my daughters’ birthday parties. They tell me what theme they want and I take it from there. My youngest wants a Strawberry Shortcake party and I figured a baking party goes perfectly with the theme. We had to recently move to another state. At first I was disappointed bc I had everything planned out, but I didn’t let that stop me. 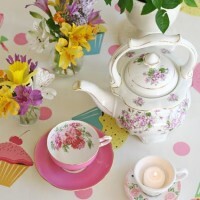 I was able to find a location that will host the Strawberry Shortcake baking party for 5 year olds! Each child will get a chef hat, apron, their decorated cakes, toy cooking utensils, and other toys that’s related to the Strawberry Shortcake characters. I love this idea and want to do it for my daughter. I. see you made the cakes for each girl. I have the 4″ baking pans. Did you do 1 or 2 layers? I’ll have to admit, I’m racking my brain and really can’t remember if I made them 1 or 2 layers! You can do them either way, and certainly a single layer would be the simplest.